(Downstream) investigating subsidy payment that the Federal Government spent N4.950.80 trillion in the exercise. This is coming at a time President of the Senate, Bukola Saraki, has declared that NNPC stinks, vowing that those behind fraud in the corporation will be exposed. Speaking at the hearing on subsidy payment, Group Managing Director of the NNPC, Dr. Maikanti Baru, said out of the N5.121.40 trillion approved subsidy, the Federal Government has spent N4.950.80 trillion, with N170.6 billion outstanding arrears for January 2006-December 2015. He said the figure was arrived at after deduction of N4.950.80 trillion received as payments from the N5.121.40 trillion approved subsidy claims of the Corporation from January 2006 to December 2015. Giving details of the accruals, Chief Financial Officer of the Corporation, Mr. Isiaka AbdulRazaq, traced the advent of the subsidy regime to October 2003, when NNPC was directed by government to commence the purchase of domestic crude oil at international market price without a corresponding liberalisation of the regulated price of petroleum products. He explained that under the subsidy regime, NNPC and other suppliers of refined petroleum products were entitled to full subsidy claims to the Petroleum Products Pricing Regulatory Agency (PPPRA). AbdulRasaq, however, noted that unlike other oil marketers, NNPC did not receive cash payment for subsidy claims as its subsidy claims were deducted out of cost payment to the Federation Account after due certification by PPPRA. 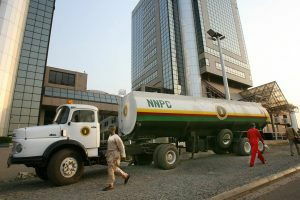 ‘’In summary, NNPC submits that the amount of over N5.1 Trillion was duly approved by PPPRA as subsidy claims for NNPC. Out of this sum NNPC is still being owed N170.6 Billion,’’ the NNPC CFO said. The Corporation called on the Senate Downstream Committee to assist in ensuring that the outstanding debt was settled to enable it effectively achieve its obligation as the supplier of last resort to the downstream sector. Meanwhile, Saraki has revealed that the NNPC has remained a cistern of deep rooted corruption, illegality and abuse of financial procedures, despite frantic efforts to reform it. Speaking at the commencement of the public hearing , Saraki said huge sum was spent on payment of fuel subsidy.